One of our clients asked us to audit a factory they were planning to work with. Read below to get an idea of how we felt during this China factory visit, regarding the daily life of a factory worker. This is one of a series of blogs that we will title: Buyer Diary. Many of you readers would most probably have no idea as to what a factory worker’s daily life would be like in China. This is written based on a factory audit that we have conducted recently for one of our clients. Factory audits are conducted by ODM to prevent us from working hand in hand with factories that are not ideal now and in the near future. Most of the factory workers reside in the factory hostel for convenience in order to save hours on travelling. Majority of the factories are located in the rural areas of China, making it difficult for factory workers to travel back and forth all the time. Many of them come from different districts in China and have to leave their home for months or maybe years to support their family. It is an extremely hard decision to make as leaving one’s family behind is not an easy thing to do. But in order to support for their family, these workers are willing to make the sacrifices. In this factory that we just conducted an audit on, the workers share a common bathing area in the hostel that they are staying at. During the cooler seasons like autumn and winter, water is boiled beforehand in order to ensure that they have warm water to bathe in. It is a tedious process on a daily basis but it cannot be avoided as heaters are not provided at some hostels. Normally, the factory workers would stay together in one hostel with all the basic necessities that they need provided for. The living quarters are well furnished with heating systems if required, allowing their workers to have a constant supply of warm water during the cooler seasons. Air conditioning is also provided to ensure that their workers get to enjoy cool air in their apartments during summer, when it turns warmer. The normal working hours of a factory worker would be from 7a.m to 5.30p.m daily. Sometimes, during the peak season, it is common for these factory workers to work overtime till 7p.m. This is more prominent when managers are preoccupied in rushing out orders to meet deadlines. Factory workers are usually entitled to one leave day a week where they get to take a day off for proper rest. There are very little career opportunities for factory workers. Most of the time, these workers are less educated and not able to get an office job. They might work in the factory for 10 years straight and still remain as a factory worker. This is because most factories would usually hire those who have completed higher education to take on the supervisors and managerial roles in the factory. The bigger factories on the other hand, will make an exception. Some of them would promote workers who have been working for them for at least 10 years to become supervisors as they would have a better experience and understanding of how the factory operates. This would be able to groom their workers and motivate them to work harder in order to get promoted. Also, this would help increase the efficiency of the factory operations. Factory workers mainly earn for keeps. They are often the sole breadwinner of their family and have to work in order to be able to send money back to their family. Every day, these workers would wake up early to go to work and end work in the evening. This cycle continues everyday. Although it is a monotonous cycle that they have to face on a regular basis, these workers are willing to do it as this concerns not only their livelihood, but also their family’s. Family is important to anyone and everyone as they hold dear to our hearts. Leaving your family for a year is not an easy choice to make. In some factories, the workers have to leave their family behind for at least a year, sometimes two. They live their own lives separate from their family, and over time, they might even start to lose contact with them. Now, you must be wondering why these workers lose contact with their family? The reason is simply because they know that their family members are safe and sound at the back of their mind. To them, there is no need to contact their family everyday just to reassure that. However, when there are public holidays like golden week, some of these workers would make a trip back to their hometown and spend some quality time with their family. Meals are vital for every working member despite all the different positions you hold. It is important for workers to eat proper meals everyday as their job scope requires them to be physically active. These factory workers have their meals in the factory daily. For this factory that we just audited, the workers’ meals consist of vegetables, some meat and fruits. There were only a couple of meat dishes served for every meal as this factory feels that there are too many workers to feed and they cannot afford to spend too much money on their meals. However, sufficient amount of protein is ensured in every meal to allow workers to have a healthy diet. Fruits are also provided on alternate days of the week to ensure that the workers replenish on their nutrients in order to work more efficiently. Sometimes, the factory workers will go out for meals together when they are out travelling or when they are on their way back from work. 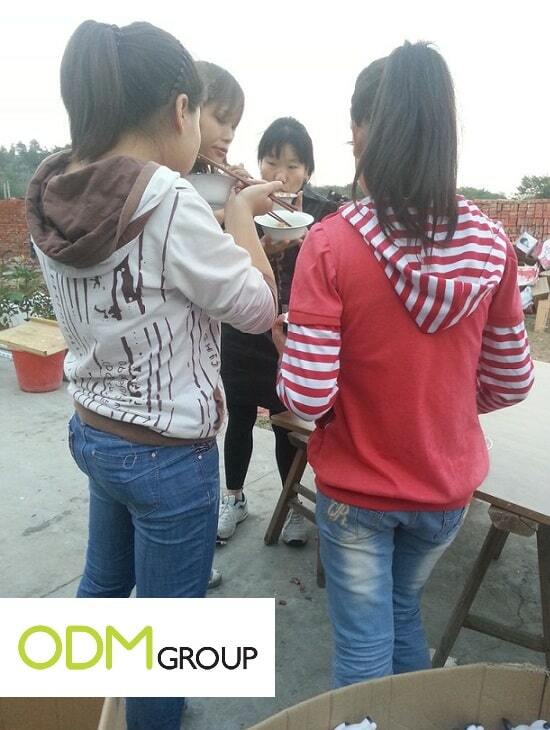 On the other hand, the other factories that ODM works with often have lunch together as a whole. There are times where their boss treats everyone to a good meal from time to time in order to motivate them at work. This also allows their workers to bond as a whole, strengthening their teamwork and allowing them to be more productive at work. In this factory, every factory worker would share a factory bike as their mode of transportation, in order to travel around the district that they are working at. Usually, three people would fit onto one bike in order to transport as many of them as possible to the destination. Even though this might seem uncomfortable and inconvenient for many, the factory workers have already gotten used to such mode of transport. Also, with limited transportation methods available, these workers do not go out very often unless they need to be out gathering raw materials for their production needs. The other factories however, own their own vehicles like cars and trucks. This allows the employees to travel around safely and quickly. Having a truck also enables the factory workers to transport goods from place to place more conveniently, without having to worry that they get lost or damaged in the process. Many of us are unaware of the kind of lives that factory workers live every day. We seldom stop to think about the number of hours and sweat that these workers have put in to come out with the final product. These workers work very hard in order to produce the final product and we should appreciate them for all the effort that they put in. ODM does not work with factories that mistreat their employees as we feel that the workers deserve much more respect and better treatment as compared to the one that we have discussed above. When a factory takes care of the needs of their workers, they would feel welcome and protected by the factory. This would motivate them to work even harder, allowing them to be more efficient and produce better quality work.